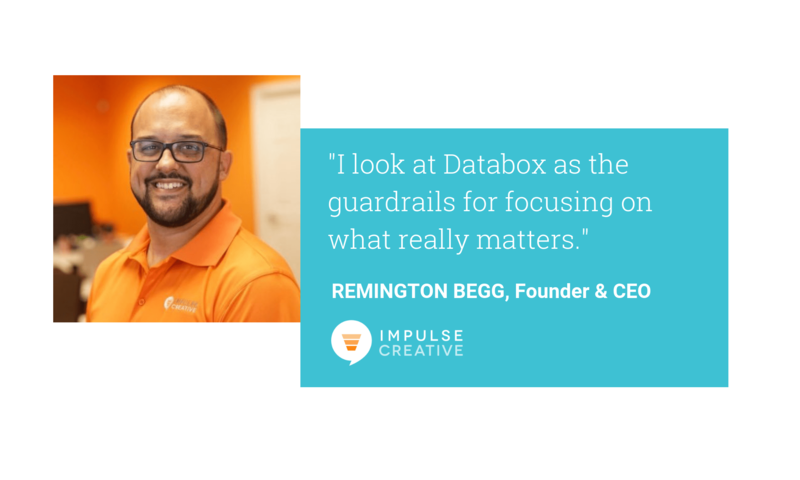 Remington Begg, founder and CEO at Impulse Creative, shares the impact that having access to real-time performance data has had on his team and agency. 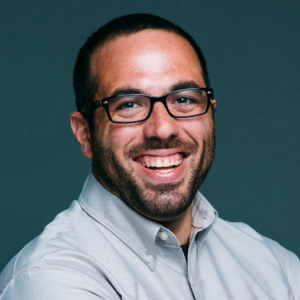 “Before Databox, we were wasting our lives creating reports through PDFs and calculating spreadsheets – it was time that was focused on the past and not on the future and ways that we could help our clients. How did your agency approach performance monitoring and reporting before Databox? Every month they’d start thinking about the presentation a couple of weeks in advance for some key wins and losses. We would spend a ton of time on this. When we looked at the number of hours spent just gathering the data to prepare for these meetings every month, it was equal to the cost of one full-time employee. Right before I jumped on the Databox bandwagon, one area that I wanted the agency to focus on was in being a more strategic agency rather than a reactive one. To do that, we had to make the data more accessible so the team would be able to act on it in real time. We needed to use that time we were wasting on gathering and reporting on data, and instead use that time developing and communicating strategy. Once we started using Databox, we now have conversations around the results. Nothing is a surprise to anyone. Why did you decide to make the change to Databox? I knew early on that the competition in the HubSpot ecosystem was going to continue to increase. I felt that in order to shine, we really needed to know the metrics that really mattered. By being able to focus on the strategy and what we’re trying to accomplish for our clients, Databox really tied into that mission. In addition to delivery, Databox also helped in the sales process, too. How has Databox helped in your sales process? A lot of time prospects have no idea how to leverage or analyze the data in tools like Google Analytics. They have no idea how to read what they’re seeing in Google Analytics because the data isn’t as accessible. So we’ll build prospects a free Databox Databoard and it’ll have all of the metrics that we care about and can affect, so it’s a lot easier to say, “these are your current stats, this is one of our clients in that same format” and then we’ll show them the month-over-month growth for a specific client and it becomes a lot easier for them to make the connection and see the value in a potential engagement. What can of impact has real-time access to performance data had on your team? Being able to see data on the fly allows for us to pivot strategies on a day-to-day basis as opposed to month-to-month. This allows for us to react to campaign shortfalls sooner and pivot the strategy for maximum effectiveness. Before we switched to the 30-day rolling, we had just a month-to-date view, which fostered the same repetition and feedback that you would get from a HubSpot report because it gives you all the data at the end of the month. But there’s seasonality as well as a variety of different issues with that approach. When you switch to 30-day rolling reporting, it doesn’t matter what day you look at the data. We can see whether everything is the green, in the red, or flat based on the things we’re doing right now. When we’re not seeing an improvement over the last 30 days, we’re able to ask specific questions as to why, and more importantly, how to fix it. Everything is more micro. When you look at a whole month, it’s hard to unpack that data and figure out why the month actually was better or worse. When you’re looking at a 30-day rolling period, you might look at specific tactics and see cause and effect a lot better. In tracking performance in real-time, we’ve seen a change in the dynamic between account-facing folks on our team having more conversations about the adjustments they could make on the fly. Since we implemented Databox, it’s really helped to foster that kind of culture. It’s allowed those micro conversations amongst the team to happen naturally. Again, all that time that you would spend finding the data and creating reports is now spent analyzing what we’re seeing and making necessary adjustments when we need to. Those things happen more organically now. How has the client relationship changed in your time using Databox? I’ve talked to a lot of other agencies and they have issues with clients being unhappy with results. Well, it’s usually the end of the month when they report on performance, and unless they’re using Databox, they have no idea what the numbers are beforehand. Those conversations are usually like, “This is your performance. We wish it could be better”, and then two days later they’re billing the client. It’s the wrong flow. What we do now is measure on a rolling 30-day basis, so now we can report when we’re up over the last 30 days. No matter when our meeting with the client is scheduled, we’re not already halfway through a month with little time to influence the numbers. It’s a lot easier to manage, retain, and upsell a relationship that way, too. What do those client meetings look like now? We try to fit all of their most important KPIs on one Databoard. This lets us distill everything down to what’s most important and most valuable in the meeting at hand. We’ll go through the Databoard and highlight the peaks and valleys. We use the Annotations tool to add our observations to certain trends so when they inevitably forget specific details from a campaign or meeting and then come back to the Databoard later, they’ll have a record for how and why certain things happened regarding performance. The final piece is we never send a Databoard to a client by itself. People hire agencies to help them figure out data because they don’t know to look at it or they don’t understand the reasoning behind why things have happened. What we do is we include a Soapbox video that shows our face explaining the actual Databoard so if they need to send that to their CEO or someone else on their team, they don’t need to explain everything themselves. This avoids a game of telephone where our insights and observations may come out completely different when explained to others. How has sharing this with client advocate for the work your agency is doing? Sometimes a client really feels strongly because in their gut a specific tactic is going to work. It’s going to be the best thing since sliced bread. Now, if It absolutely flops, that will be known right out the gate so we’ll be able to pivot very quickly. A lot of times when we launch campaigns we’re pivoting very quickly based on things we’re seeing in real-time. I look at Databox as the guardrails to focusing on what really matters. Want to get a firsthand look at how agencies like Impulse Creative use Databox to automate their client reports, set client goals, and much more? Sign up for one of our live agency demos.